What is zone heating? Zone heating is simply the practice of turning down the central heating system and using zone heaters for additional warmth in the rooms used most often. Many other parts of the world practice zone heating to reduce energy costs and increase comfort and now, with the cost of energy rising in the United States, it’s beginning to catch on here, too. The biggest benefit of zone heating is the dramatic reduction in your home’s heating bills. According to the U.S. Department of Energy, the average homeowner can reduce heating bills by 3% for every one degree the central heating system is turned down. Now, 3% may not sound like much but imagine if you turned the thermostat down from 75 degrees to 65 degrees…you would save 30%! For more than 30 years, Stuart’s House of Vacuums has been selling zone furnaces, beginning with the true original “heater in a box,” the Solar Comfort. An inventor by the name of John Paul Jones was experimenting with ways to address the challenges of heating an old Victorian home in the Springfield, Missouri area. He came up with the the idea of putting 4- 375 watt infrared heating lamps located directly below a specially designed metal heat exchanger. It worked great! 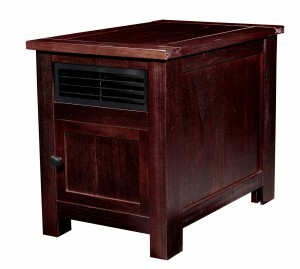 In recent years, many manufacturers have introduced their version of a “heater in a box” to the market and while most operate based upon the same concept as the Solar Comfort, there are many differences in the quality of components, cabinetry, the country in which they are manufactured and the availability of warranty and service providers. As with every product they sell, service and repair (warranty or otherwise) is completed on-site by expertly trained technicians. 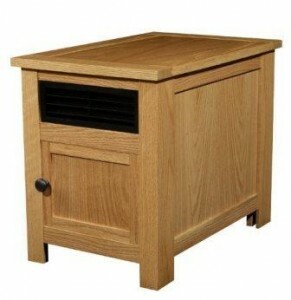 The Ultimate Portable Heater, the Summer Breeze heater is made in the USA by the Riccar company. This is the best quality heater we’ve seen. Not only is it well made, but it looks like real furniture. It plugs into a regular outlet and doubles as an end table, so it can be in place year around, ready to heat a room anytime needed. 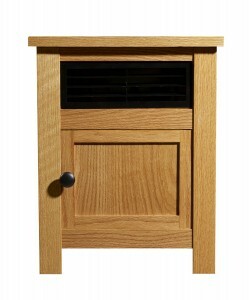 The Riccar Summer Breeze Heaters are available in Oak or Cherry finishes. Since they are made in the USA quality is excellent, and service after the sale is handled in a fast and efficient way.